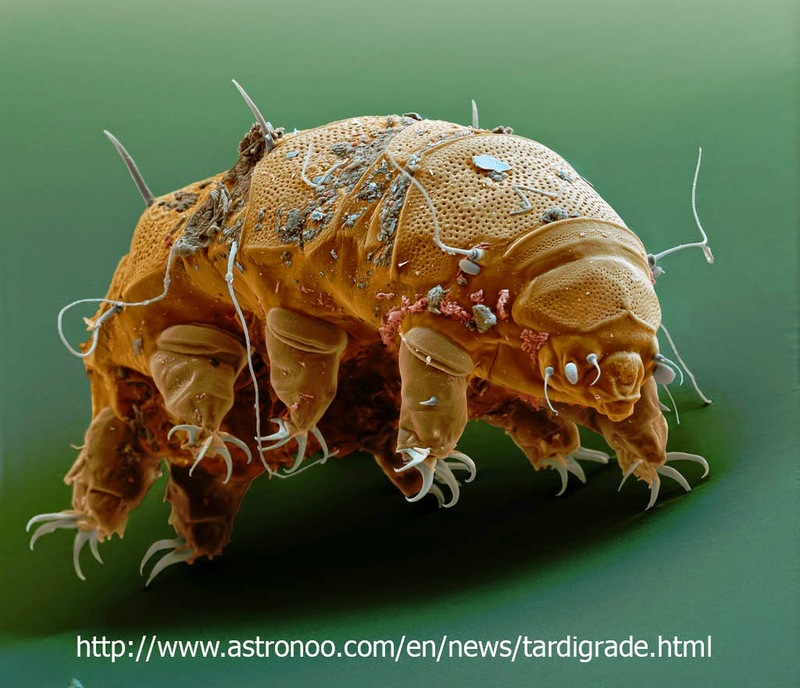 And now the creature we've all been waiting for; the indestructible Tardigrades. If you haven't heard of these guys you are in for a treat today. Tardigrada is a whole Phylum of animals commonly known as water bears. Their most notable characteristic being that they are virtually indestructible. They have a really cool trick known as cryptobiosis. When they are in a threatening environment they can shut their metabolism down completely. This isn't just slowing the heart beat down and lowering the body temperature, while in cryptobiosis there is no metabolic process whatsoever. They are essentially dried out husks and are temporarily not living. In this state they are called a tun. Their normal method of cryptobiosis involves dessicating themselves and when they are immersed in fresh water their metabolic processes will start up again. In cases of low oxygen they often take in extra water and high oxygen environments remove the water by osmosis and their metabolism starts up again. A Tardigrade tun coloured SEM. We've tried everything to kill these guys including boiling them, freezing them even to 1 degree above absolute zero, dehydrating them and starving them, sending them to space and exposing them to the vacuum and radiation. They can survive pressures up to six times those of the deepest ocean trenches and ionizing radiation hundreds of times more intense than would kill us. They can survive some really nasty environmental toxins and preserved specimens have been known to survive formalin and alcohol preservation. They are slow moving eight legged and have an exoskeleton. These tiny beasts only grow up to about 1.5 mm long in the larger species but with at that mouth and those claws they look like savage predators. Most water bears are actually vegetarians eating only algae or moss. They are usually found in moist areas on moss or ferns. 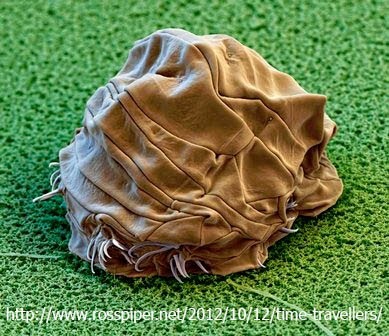 Water bears are found from the oceans abyss to the highest mountains in the world on every continent and every ocean in the world. There seems to be a lot of diversity in Antarctica due to their ability to freeze for years and reanimate. 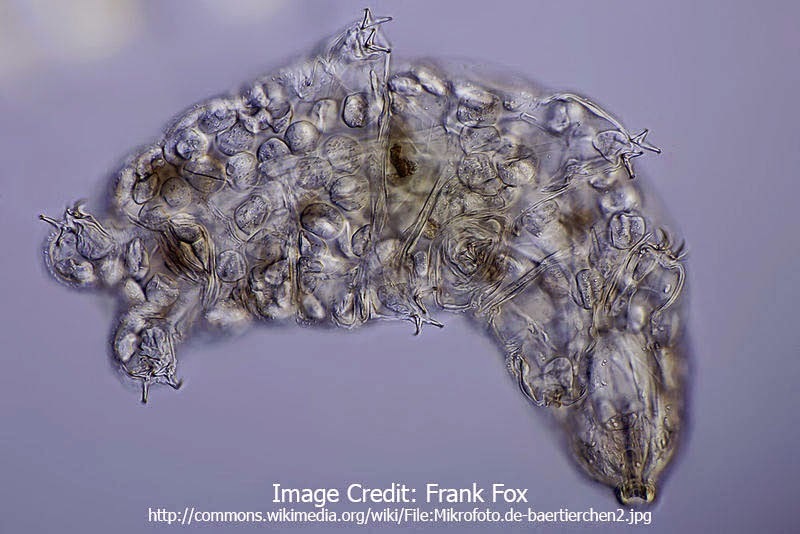 Tardigrada is related to the Phyla Arthropoda and Onycophora and together they form a group called the panarthropoda. The exact nature of the relationship has been the topic of some debate. I favor the hypothesis that they are the basal group of the Panarthropoda, which seems to be the dominant hypothesis.